Meier’s Lucy Stone novels should add this series to their lists. This book is a work of fiction. Any resemblance to actual persons, living or dead, is purely coincidental. he bamboo-like cuttings lay piled on the table next to a yellow, water-filled plastic basin, each matching the others precisely in length, as if that somehow mattered. Rubber-gloved hands picked them up one by one and placed them into the water, pushing them under gently, almost lovingly, leaving them to soak. A soft voice read aloud from a book propped open nearby, reading slowly, as if savoring each word: "Oleander... Extremely poisonous... heart stimulator... immediate reactions...."
A chuckle rolled out. "Perfect." The hands returned to the cuttings and squeezed the leaves tightly, wringing out every possible drop of liquid before removing them from the water. Fingers gripped a small bottle, dipping it into the basin, holding it, tipped, until the excess air bubbled to the top, then capped and wiped it. Steady hands slid the bottle onto a shelf, unlabeled, to sit among similar-sized jars of ordinary spices. "A fitting place for you to be," the voice said to the innocent-looking bottle in a mocking tone, "since you will add a certain zest to someone's food. Soon." and Maggie hummed an occasional, somewhat juicy note or two along with her as she savored the taste of tangy cherry, her favorite. With the winter sun shining brightly through the windshield, warming up the interior, Maggie had long since shrugged out of her parka. She watched the snow piles edging the borders of the Garden State Parkway slowly grow in size as she headed north, the small tingle of excitement down in the pit of her stomach growing along with them. Maggie had left Baltimore behind in the dark, pre-dawn hours that morning and was driving up to ski country. The most important equipment she had packed that morning, however, were not skis but her laptop computer and printer. Maggie expected to spend several weeks in Cedar Hill, New Hampshire, and, while some skiing was in the picture, she planned to fill most of her time at her computer, writing. "Maggie, that's great," she remembered her friend Dyna Hall squealing into the phone, obviously truly happy for her when she heard Maggie had received a contract on her book proposal, a children's math puzzle book. "Why don't you use my folks' cabin up in New Hampshire to work on it? You could have it all to yourself. No distractions. It'd be perfect!" It had been tempting. Maybe too tempting? Dyna promised no distractions. However, living within reach of ski slopes when you loved to ski could reasonably be called a distraction. But Dyna continued to push it. "I could come up with you, just long enough to get you settled in, of course. We could take a few runs down the slopes at Big Bear before I take off, so you could pick out your favorite ones for later." When Maggie protested that she would have to spend her time writing not skiing, Dyna argued, "But you have to ski, at least a little. The exercise will be good for your brain. You'll have plenty of time to write, but you can't work sixteen hours a day. You'd have to have some fun time. How can you write a fun book for kids when you're not having any fun?" Dyna's argument had a certain logic to it, Maggie had to admit, a kind of "Dyna" logic, but reasonable. She had mulled it over. With Maggie's boyfriend, Rob, away for the time being teaching at a Florida tennis camp, maybe a change of scene would be better. If she stayed in Baltimore she knew she would face many wrenching reminders of his absence simply by driving past places they had frequented together. Then there was Maggie's mother, beginning to make noises about Maggie possibly helping out at the family bakery, "...just once in a while. It's so hard to find good help, and you'll have this free time... ". That had tipped the scale. stayed within sight and reach of her mother. She started packing. and settle down to the serious work of writing her book as soon as she had the place to herself - which was what she looked forward to most of all. "Solitude, peace and tranquility. It'll be great," Maggie said to herself between hums with Reba, amused at the same time at the contradictory excitement the words stirred in her as she said them. Solitude and excitement. Maybe it was a weird combination for some, but it worked for her. She could hardly wait. As the landscape grew steadily whiter during her drive northward, she realized that for most of her life, first as a student, then as a teacher in a school system that seemed to close at the first fall of a snow flake, snow had become equated with days off. And now she was anticipating many, many snow days. A definite plus, but there was also a worrisome side. Taking this time off from teaching was risky. Harvey Braun, her principal, had been less than thrilled with the idea when she broached it to him. "A leave of absence in the middle of the school year? You're out of your frigging mind!" was how he had charmingly put it. But Maggie had hung in there, managing to discover, through rapid networking, an available teacher newly moved into the area and looking for a few months' work until the birth of her first child in August. The risk was that since she and Harvey had butted heads a few times in the past, she might find her job filled permanently instead of temporarily. and offered a contract on it dependent on her quick production of a finished manuscript, there was no way she could let the opportunity slip by. The problem was that not only did she have to produce a publishable book, but since it was a one-shot deal it certainly wouldn't make her independently wealthy and she would need her old job to return to. Would it be there for her? "I just don' kno-ow," an unknown female singer wailed from the stereo. Maggie punched the button hard to change the station. Sometimes a little country music went a long way. There was no use, Maggie told herself, worrying over a decision she had already made and was acting on. She had taken her leave of absence, she had packed up and left Baltimore and soon she would be in Cedar Hill, New Hampshire, writing her book. The best thing she could do right now was to concentrate on her driving. She realized, as she turned her focus back to the road and checked a few signs, that the miles had been flying by. She had driven through much of Massachusetts and would cross into New Hampshire before long. Then the mountains would be straight ahead. When she came to that part of the trip she could only hope that Dyna's directions for the final leg were correct. Dyna had many good points. Organization, however, was not one of them as her mind tended to flit around many distracting thoughts. side in preparation for their simple, hotel-arranged, fun match. That, and her following off-beat conversation had thrown Maggie for a while. Having spent much of her life around down-to-earth practicality, Maggie had been quite unprepared for someone like Dyna. It didn't take long, though, to realize how totally likeable her new acquaintance was, despite, or perhaps because of her oddness, and their friendship had endured beyond that vacation week. Their unexpected involvement and collaboration on a murder investigation during that vacation might also have had something to do with their lasting camaraderie. Another thing that had endured from that week at the Highview was Maggie's relationship with Rob Clayton, the tennis pro there. They had met over a tennis lesson. Now, however, he would be giving tennis lessons to other women, many, many miles away from her. But she wasn't going to let herself worry about that either. They may be many miles apart, but the phone lines would keep them connected, calling each other, as they had promised each other, every night. Lowell sped by, Manchester, Concord, and then less familiar names appeared on signs. Snow had begun to fall lightly, but the roads remained relatively clear. She finally turned off onto the two lane highway Dyna had directed her to, keeping her fingers crossed that it was the right one, and before long billboards and motels were replaced by picturesque farm houses and barns tucked against snowy hills. Maggie loved it. She found the turn-offs onto smaller and smaller roads - some numbered, some named - that Dyna had written down for her and soon, to her excitement, she was pulling into Cedar Hill. The small New England town sat post-card pretty in the late afternoon sun, church steeples stretching high above white-shingled houses, a red brick school with flag flying in front, small shops, a bank, all interspersed with tall pines and red cedars. a mother pushed her rosy-cheeked baby in a stroller along the cleanly shoveled sidewalk, beside two-foot high piles of snow at the curb. Across the street on the left, people in parkas and ear-snuggling knitted caps walked or stood chatting in small, friendly-looking groups. Maggie soaked it up, her smile growing. d consulted, actually climbed a hill and slowly angled away from it. 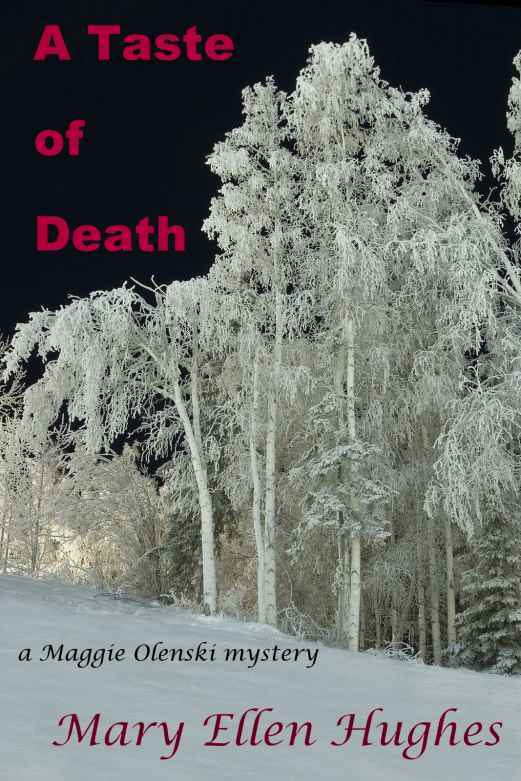 Maggie drove past dense woods on each side, once glimpsing a deer, or at least its white tail flashing as it leaped away. Within a couple of minutes a small group of houses appeared, most seemingly vacant. Maggie checked their numbers and counted, finally stopping beside one whose driveway was the only one cleared of most of its snow. The etched pine plaque hanging on a pole beside it said "Hall" and "Welcome". Maggie looked up at the house in amazement.